The moment arrived. I opened the New Zealand Census webpage, filled in my code and with one click of the mouse became a No Religion, one of the fastest growing groups in our community. To be honest, I didn’t feel that I had an option. Although I’ve tangled with what we mean by God for most of my life and been ordained as an Anglican priest, when church authorities made it clear that I wasn’t welcome because my writing was not Christian theology, the door slammed shut. But the act of ticking no religion had a peculiar feel to it, partly because I know that our depth, breadth, and variety of spiritual expression is not going to be told by this one-dimensional categorising. 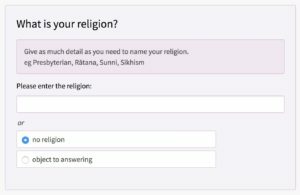 However, data has its uses and I’m pleased that The Humanist Society of New Zealand has been promoting the no religion option during this census so that we can get better clarity about religious adherence. One important reason for this is to force the separation of church and state, which has not yet been achieved in New Zealand. For instance, the current practice in military and hospital chaplaincy is to employ only Christian ministers who need authority from their church bodies to be considered suitable. Even the United States, one of the most arguably evangelical Christian countries in the world has done away with this reliance on church authority. The Spiritual Care Association who certify chaplains does not see a faith-based endorsement as evidence of a person’s competence. My work as the Spiritual Care Coordinator at MidCentral District Health Board shows me that, whilst many more of us are ticking no religion, significant numbers of people continue to be attached to a particular tradition, but the range of religions is becoming more diverse. Better foundational data will help us be more aware of and responsive to changing needs. Even so, the greater number of people admitted to the hospital where I work do not claim a religious connection. What I find is that despite the labels people may, or may not use, many find themselves in a process of soulful reflection, especially when facing death or significantly changing circumstances. If you give people the opportunity, they still want to talk about what matters to them most, how they make meaning and reverence the sacred, and mark with respect the important moments in their lives. By soul, I don’t mean some ethereal body part that floats off to another realm at death. Instead, I mean, as Thomas Moore so eloquently puts it in Care of the Soul: A guide to cultivating depth and sacredness in everyday life, that part of human experience that lies somewhere between understanding and the unconsciousness, whose main instrument is the imagination. Soul has to do with genuineness and depth and is revealed in attachment, love, and community, along with intimacy and the journey to the interior. When soul is neglected, ‘it doesn’t just go away,’ says Moore, ‘it appears symptomatically in obsessions, addictions, violence, and loss of meaning.’ He’s someone worth listening to. So, whilst we’re ticking no religion for a multitude of reasons too diverse to explore here, there is still personal soul work to be done. For me, this arises from the religious and spiritual impulses deep within me and somehow connected to others across time and space. It includes the process of exploring identity in a world racked by tragedy, whilst still being enlivened by moments of awe and wonder. My soul work means deciding what matters most to me, what is sacred and to be revered. What I make of how I came into this life, how I connect with people, animals, the environment and the sacred before deciding how I want to die and how to mark all those moments. In essence, it’s about creatively working with the fragments of my life, so I can weave them into a coherent narrative of light and shade that has a sacredness I can nurture. None of this needs authorisation from a religious body, what it does need is my commitment to everyday soulfulness. Thanks Karen. Yes, it’s all too simplistic and might well be misleading. We certainly do use the definitions down here like the Puchalski one that includes the search for meaning that you point to. And I could fit that SBNR idea and I did toy with it but in the end, went for clear lines based on not owing allegiance to a particular religion right now. That seemed the more honest choice, acknowledging the blurry boundaries. In a way, my situation maybe illustrates how absolutely confusing it is for everyone, particularly down here in New Zealand where the rapid flight from Christianity might be even faster than over in the US. We live in interesting times and my creativity is in full flight! I remember hearing you speak a few years ago. Thanks for reading Dale. Good to make a connection another way. Thank you for this thoughtful piece Sande. It’s my pleasure Carole. Thanks for reading.